Get inspired by Yigal Mesika to live the loops! Mesika, who gave Finn’s creation phenomenal versatility, has performed in 40 different countries using the Loops and elevated it to an art form. He is seen here live and unstaged, warmly interacting with the audience, charming and confounding them with his signature effects that are absolutely undetectable to hypnotized onlookers sitting right next to him! Even skeptics are dazzled! Learn from the leading master of Animation and Levitation the top secrets on how you to can create an impossible reality! You will be able to perform a complete half hour show based on this one tool that will totally rock your audience! • Everything packaged in a stylish metal case. 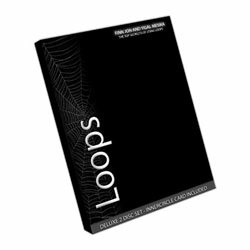 * INCLUDES: The patented Innercircle Card, the official carrying case for the most astonishing and versatile tool in magic, Loops! This custom-made carrying case was specially engineered to look like a credit card making it extremely convenient to slip right into your wallet, not only protecting your Loops, but also making them easily accessible.